China's war with Winnie the Pooh has intensified, as Beijing has reportedly banned the new Disney film "Christopher Robin" as part of their new crackdown on the half-naked bear. Why? Because Pooh has become a resistance icon over Chinese social media due to his resemblance to Chinese President Xi Jinping. While the Guardian notes that it's possible the Pooh film was simply blocked due to China only allowing a certain number of foreign films in its theaters annually, the Huffington Post pointed out that Chinese censors have been relentlessly scrubbing Pooh-related material from the web. 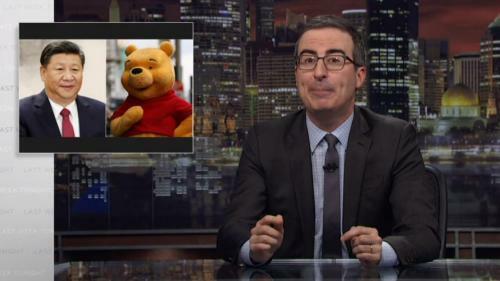 In June, China blocked HBO's website after host John Oliver devoted a considerable amount of time criticizing President Xi Jinping and China's notorious crackdowns on dissent, at a time when Xi is trying to rebrand himself. The Daily News reported at the time that HBO.com has been blocked for 100% of Chinese internet users following the segment - citing internet monitoring website Greatfire.org.